Are you the new entry-level hunter that is still learning about crossbows and arrows? If that’s the case for you, you also need to know some basics about crossbow bolts. You must have heard by now talking about the quarrels, the arrows used with crossbows. As arrows typically have square heads and “carré” means square in French, you can see now where is the name coming from. Crossbow bolts are typically shorter than classical arrows and the sophisticated models come with lighted ends, attached to the nock of the arrow. The second you release the arrow, a light shines back at you, showing the path of the arrow. Not only it’s easier for you to get the arrow back, but you also get a view on the flight pattern. In addition, not to mention you see the impact on animals you targeted. You may find crossbow bolts as long as 20 inches or slightly longer. If we take the closer look, we see they are made of several parts that sure tell you something on the overall performance of the bolt. The shaft on the bolts is most of the time made of carbon or aluminum and are lightweight, whereas the nock is either plastic or aluminum. The nock keeps the bolt in place and there are only two types: half-moon and flat. The small wings on the arrow are the fletchings (also known as vanes) and guide the arrow in the right direction. As for the heads, there are only two main types: broad heads and field points. Now that you know the details on the crossbow bolts, you can surely go shopping. 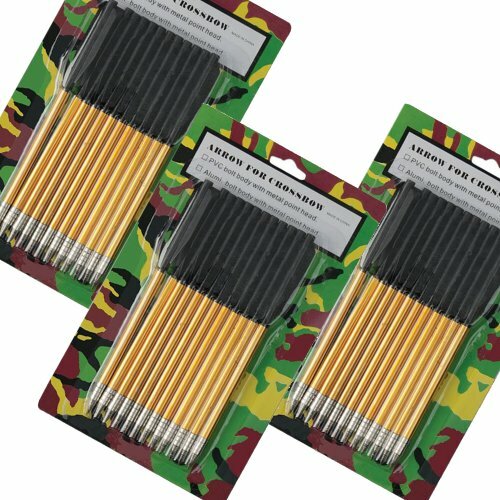 Are you looking for some crossbow bolts that solve your training problems? You can get pretty good quality crossbow arrows like the Aluminum Pistol Crossbow Arrows. Sure, you can’t expect them to be the best option out there, but you’re not going to get a lemon either. The 36 aluminum bolts are quite versatile and you may safely use them on 50 and 80lbs crossbows. They feature an aluminum shaft and a metal tip, which gives them some durability. And now that we talk about durability, it’s good to know the bolts are strong enough to stand up to frequent use. The length goes a bit over 6.25” and they have just the right weight. If you like, the small games (rabbits, squirrels), the bolts make a good option. They fly true and hit hard and the accuracy is not that bad either. The golden color on the shaft makes them so easy to find. For the money you pay, they are pretty well made. For a low price though, you get some pretty good crossbow bolts that have plenty of qualities and some issues, just as well. Do you need small bolts for your hunting experiences and don’t want to spend too much money? 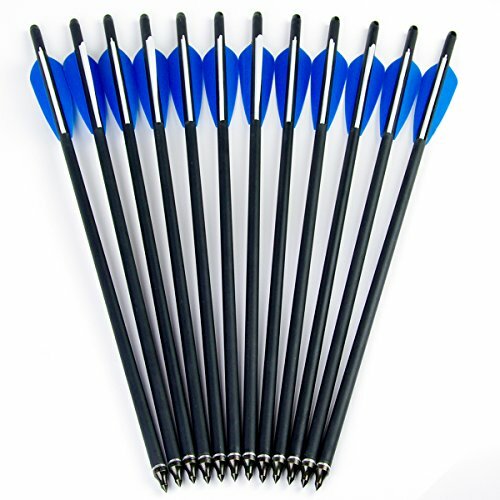 The Speed Track 60pcs for 50lb 80lb Pistol Crossbow Cobra Small Bolts are a great option to try and they bring some good features to the table that got our attention. The crossbow bolts are very sharp and they are pretty well made. You may safely use them for 50lb or 80lbs Style Crossbows. It’s not difficult to use the bolts, as they are lightweight and quite accurate. They are sharp and stick into wood, even though you may need to pay attention when getting them out. The crossbow bolts sure do what most of bolts do out there: they fly well, accurately and are pretty flexible. They do have a good build and may surprise you with the durability. Therefore, for the money you pay, you sure get a good package of lightweight, sharp and durable bolts. They come in yellow, black selected randomly, which is both useful and fun. For the money you pay, we’d say you end up with some flexible, lightweight and sharp bolts that do fly well. 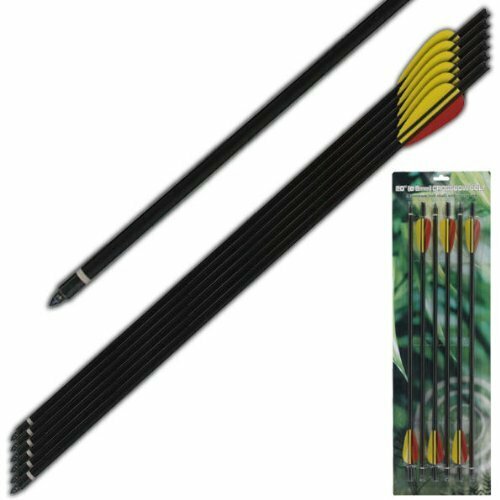 If you want to experience the performance of some aluminum bolts, don’t hesitate to take out on the field the Extra Survival Aluminum Crossbow Arrow/bolt Black 20″ 6 Piece Set. The 20” aluminum arrows make a great choice for 150lbs hunting crossbows and come in a 6-pack. The bolts are compatible also with the 120-200 lb. crossbows. They come with half-moon nock end and field tips. The tips are removable so the bolts sure become more versatile. We can’t complain on the performance of the bolts. They sure do fly straight and true. For the money you pay, they sure perform well and you can rely on them. They are475 grains and quite deadly on a deer. All in all, for a very good price, you get pretty dependable, accurate and fast aluminum arrows. Get more speed and accuracy on your shoots with the Bloodsport 20-Inch Crossbow Bolts. The crossbow bolts present a .003 straightness and are 20” long. They come with glued-in insert and have 9.0GPI. The bolts come in a convenient package of six. They fly very well and straight. A more detailed look gives us an overall weight of 325 grains for finished bolts and nice weight for retained energy and terminal performance. If you are an avid hunter, it’s very likely that you enjoy the versatility of the bolts. You may actually choose a field point or broad head weight, depending on your job and you can manage the overall arrow weight to your very own crossbow. The bolts present a solid build and are quite tough. They have a mechanical broad head and go great for compound bows. They take the heavy-duty use and give you efficient accuracy each time. All things considered, the bolts do come with plenty of good things and only with some minor drawbacks. 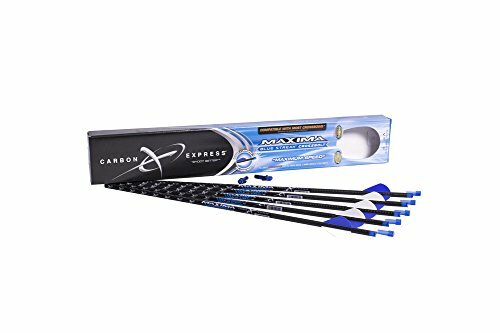 When you feel you are ready to try some of the heaviest carbon cross bolts out there, give it a try with the Carbon Express PileDriver Fletched Carbon Crossbolt. The cross bolts in CX lineup give great kinetic energy and amazing knockdown power. 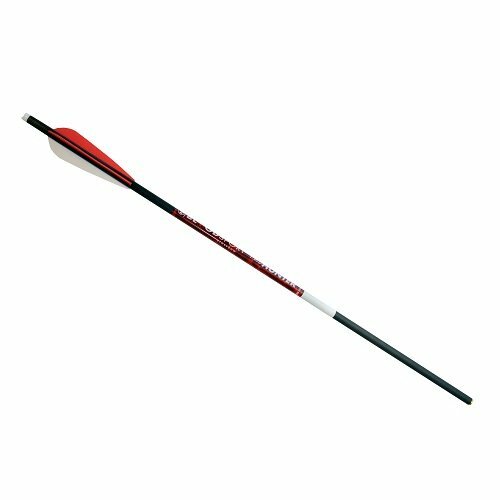 They are fletched with 4” vanes and are highly versatile as they come with moon nocks and 6 universal flat nocks. The Launchpad Precision Nocks give better shaft alignment, better control on arrow release and constant precision. For better protection of the shaft against nock-end impacts, the bolts come with a nock collar. Every hunter likes precision and these bolts sure give you that. The great build of the bolts, with consistency in the spine and strong knockdown ensure the high accuracy. As they are made of heavy carbon, the bolts also give you bone-crushing penetration. It’s all in the materials when it comes to crossbow bolts and the composite material on these ones provide durability on impact, constant performance and reliability. The construction of the bolts is also impressive and the Built-in Weight Forward is a patented technology that increases downrange precision with a broad head. Laser sorts every single bold, so every shoot is consistent and straight. The crossbow bolts fly straight and have a durability feel. They hold up well to wear and tear and work great. All in all, for the precision and consistency they give on every shoot, the crossbow bolts are a heavy option to consider. If you are looking for some reliable crossbow, bolts take a leap of faith and give it a go with the Barnett Outdoors Carbon Crossbow 20-Inch Arrows with Field Points. The 20” bolts come in a set of 5 and feature half-moon nocks. The 8.1-ounce bolts feature tough, lightweight carbon shafts that explain the precision and speed. The bolts also have better wall thickness for longer life span so you are able to take them for deer hunting for a couple of seasons. When we go through the numbers, we see 13.78 grains per inch that matches 100-grain point. The bolts are very precise and sink deep into target. They also include 24F field point and moon nocks. We sure like the versatility of the bolts and you may use them for Ghost 350, Wildcat C-5, Jackal crossbows and Penetrator. The bolts fly true and are easy to spot out in the field. They have a good balance and fly so nice. They leave a durability feel and it’s impossible not to notice the nice fit and finish. Nevertheless, the crossbow bolts are a dependable option for your deer hunting as they fly well and are so accurate. And, if you want to get a bundle that also includes Barnett Cross Game crusher, take a look at this one. Good crossbow bolts are supposed to give you speed, precision and kinetic energy. The Black Eagle Executioner Crossbow Fletched Carbon Arrows/Bolts make no exception and they are a great help for any dedicated shooter. The carbon-crested arrows are designed and made to give accuracy, speed and kinetic energy. They come with Executioner brass inserts installed, getting just the right weight for the best F.O.C. (forward of center). This is how the bolts actually become more precise during the flight, without losing any of the kinetic energy, nor the speed. The accurate consistency of the bolts is also determined by the Grouped Together technology that is used to match spines on all dozen arrows. The shafts are weighed and grouped for the perfect match, as a matter of fact. 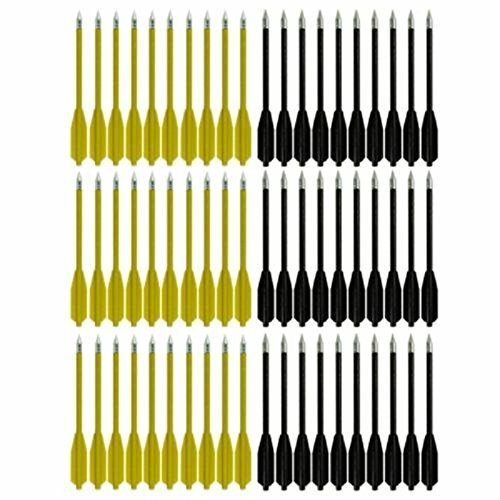 The Black Eagle Arrows measure the full length of the shaft. As for the nocks, it’s good to know the bolts come with half-moon nocks and flat nocks that are easy to remove. The nocks are actually pressed fit and not glued. 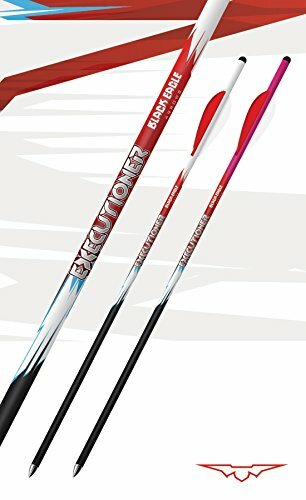 The 20” and 22” fletched arrows come with 3” Bohning XVanes, whereas the 18” fletched arrows come with 2” Blazer Vanes. Let’s not forget the Executioner Brass Inserts already installed. The bolts sure fly well and are flexible. They are sturdy and hit hard, straight every time. As you can see, none of the issues relate to the quality or the performance of the bolts. As they fly well and are flexible and accurate, the bolts are sure worth to try. The more you are willing to pay for your crossbow bolts, the more you need to expect when it comes to their performances out on the field. 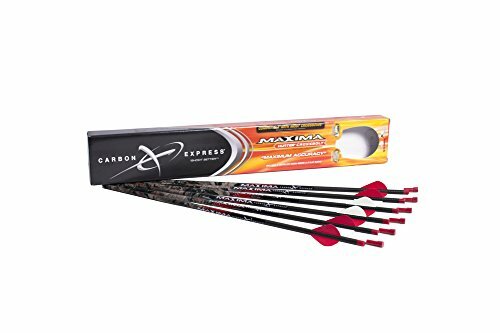 The Carbon Express Mayhem Fletched Carbon Crossbolt with 3-Inch Vanes are made with advanced carbon materials, giving you amazing speed, precision and penetration. All the details on the bolts sure create some good quality bolts that you can depend on in many situations. We begin with the new multi-layer construction that increase the strength of the bolts. We also notice the impressive down range precision and penetration with a broad head. When it comes to vanes, we see the bolts present high performance vanes, but also inserted moon nocks and no less than 6 universal flat nocks. The accuracy is sorted for straightness, giving you amazing consistency shot after shot. Just to be more precise, the straightness is +/- 0.0004” max. The bolts fly right and have a great weight. They are made to last and the vanes don’t bent. The nocks sure fit into this picture, as they are also good quality. We don’t consider the minor issues deal breakers as they say nothing about the real performance of the bolts and we like them for what they are: durable, accurate and with great weight. 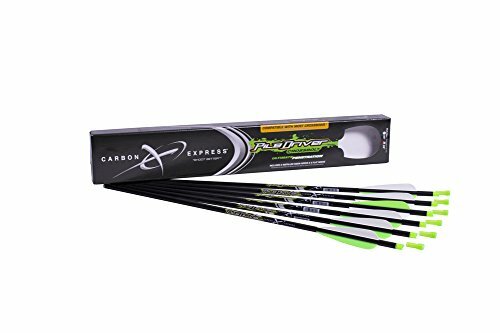 For the hunter that likes speed as much as he likes precision, a great option as crossbow bolts is the Carbon Express Maxima Hunter Fletched BuffTuff plus Carbon Crossbolts. Without getting too technical, we need to mention the bolts are made with Dual Spine Weight Forward technology, which sure explains the fast recovery and the better trajectory, giving greater down-range shot placement. The strength and accuracy is explained by the precision design that comes with the patented BuffTuff Plus carbon weave. BuffTuff plus used in the back shaft section includes 100% high modular carbon weave into the outer layer, ensuring the power and durability. You can surely notice on your own the Mossy Oak tree stand pattern, which makes the bolts looking amazing. The more we look at the bolts, the more we appreciate the features and qualities. The bolts come with high performance vanes, 6 universal flat nocks and also inserted moon nocks. The bolts are laser sorted, for straightness and weight and this gives them more consistency also. They shoot great and sink deeper in the target. They also shoot flatter and very fast. The bolts aren’t very heavy, but are tough and come with firmly attached fletching. Nevertheless, the bolts are a great choice for any shooter that likes speed and accuracy on his shoots. 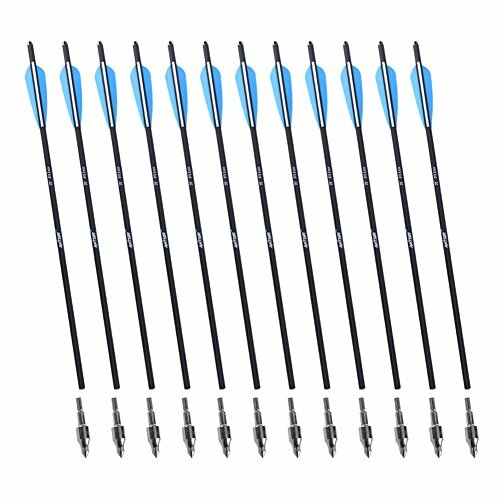 The premium 100% carbon build on the Carbon Express Maxima Blue Streak Fletched Carbon Crossbolt gives you bolts that are fast and have a flatter trajectory. We need to explain the high quality of the bolts by telling you about the good spine consistency given by the Patented Diamond Weave. The Buff Exterior comes with precision-milled insert, giving more power and consistency. The Dual Spine Weight Forward technology ensures fast recovery and improves trajectory, giving greater down range shot placement. The description of the bolts continues with the high performance vanes and the inserted moon nocks. The bolts also come with 5 universal flat nocks and 2 blue Lazer Eye lighted nocks. The bolts sure fly true, fast, and make it as a great choice for white tail hunting. They are true to weight and have a long lasting build. As they are accurate, fast and so dependable, the bolts are a sure buy anytime. Do you find yourself torn about not knowing if you need to pay the extra buck for some high quality crossbow bolts or you simply have to settle for the medium quality? You don’t actually need to pay a lot in order to get some great quality bolts. Take a look at the Antsir 20″ Hunting Archery Carbon Arrow Crossbow Bolts and you’re going to convince yourself that this is a good example how high quality doesn’t always have to come for a higher price. The bolts feature a more consistent wall thickness composite carbon shafts, which increases their durability. The carbon bolts come with half-moon nocks and 4” vanes (two blue one white) and make a nice option for crossbow hunting or practice. You can easily match the bolts with 125-grain Broadhead and aluminum insert for screwing the arrow tips. In terms of performance, we sure like how the bolts fly. They have a nice, straight fly and are accurate every time. They are strong bolts and have a good balance. It’s very comfortable to use them, for a very long time. The bolts get to you very well packaged and make a reliable option for your practice or crossbow hunting. The minor issues aren’t deal breakers for us and we really like the bolts for the accuracy, straightness and the very good price. Thanks to high technology, you can actually find nowadays so many great carbon crossbow bolts that not only bring great performance, but also don’t make you pay so much money either. So trying to settle for just one example in this category is no easy task, but we are pretty confident about this one. The TenPoint Pro Elite Carbon Crossbow Arrows (6 Pack), 20″ are 425-grains bolts including 100-grain practice point. The carbon fiber bolts are sure lightweight and so easy to use. The 22/64Ths diameter Easton carbon fiber arrow is fletched a bit offset with a 3-inch Fusion shield cut Q21 vane. They come with Neon Yellow Omni-nock so it’s very easy to find the bolts. The bolts are fitted with 68-grain brass insert and features 6- 100-grain field tips. You can tell about the high quality of the bolts as they are not only made in our USA, but also precision engineered by Easton. All shafts are thoroughly checked for straightness to within 003 and also hand-sorted for weight tolerance to within two grains per dozen. The bolts have a good balance and if you want also the numbers, they are balanced at 13%FOC. We like the bolts, as they are lightweight and shoot accurate and straight. They fly great at long distance, don’t warp nor bend. They may come in various colors and are build to last. Despite the minor issues, for the accuracy, durability and straightness, the bolts sure make a great choice for carbon crossbow bolts. Versatile, reliable and so easy to spot, the Lumenok 20-Inch Barnett Headhunter Equipped Crescent Bolt End are a great example of high quality crossbow bolts. The bolts are 356 grains each and come with easy replaceable battery. They come in various colors so you can find your own liking. For a better understanding of the bolts, we tell you how they really work. The Lumenok is activated upon the shot and is based on the conductivity of the shaft. You need no switched or magnets. You may use the Lumenok for a big time so it lets you to follow the path of the bolts. As for performance, the bolts do give you accuracy and work amazing with 100 gr mechanical broad head. They consistently lit up and fly true each time. Nevertheless, the bolts remain a great 20-inch option you should try when hunting. Either you go deer or turkey hunting, don’t hesitate to get some help from the M.A.K® Hunting Archery Carbon Arrow 20″ Crossbow Bolts Arrow. The carbon bolts come with half-moon nocks and 4” vanes (two blue and one white). They also feature aluminum insert for screwing the arrow tips. The bolts are designed and build for the crossbow hunting, but handle quite well the practice jobs and archery. The shaft is 20” and the arrow point is 125 grain. The nocks are correctly aligned and the bolts are very well made. The bolts sure fly right and accurate. They really get into the target, but it’s not that difficult to take them out. They don’t bend nor warp and take the intense use. We like the bolts, as they are well balanced and so accurate. They come well packaged, in 12 pcs set. Despite the minor issues, we like the bolts for what they are: reliable, versatile and long lasting bolts for crossbow hunting.